2 Anyone Think Her First name Will Be Opal? Okay, well, if you open up a character map and check the characters like I did, you can see the characters of her name are 'Be', 'Ru', 'Ri', 'Tu', and 'Tu'. So, um, I think it's assumable there's SOME source on it. An another note, though, before changing it to something like 'The Lady', you should wait and see, because that's really a terrible and non-specific name for an article. Anyone Think Her First name Will Be Opal? Since this would work for the third version, with Giritina as the cover pokemon. Not only does Opal actually work for a girl's name, but it also associated with Giritina. —The preceding unsigned comment was added by Clark Griswald (talk • contribs). I know it's just an assumption, but doesn't it APPEAR to be true? Giratina's association with Girasol and thus a pearl. I mean, I don't see anything related to Jade around. —The preceding unsigned comment was added by Clark Griswald (talk • contribs). Well, you never know. It may be a valid assumption, and it may end up true, but we can't risk putting something that's not a concrete fact here. Heck, I think the third could very well be Ivory, as that's an organic stubstance that's considered to be a precious thing, much like pearls are. As for the diamonds, they're grouped with rubies, sapphires, and emeralds as the precious gemstones. Plus, if it were Ivory, it would relate to Arseus in its color, and not to mention, that Dialga and Palkia are said to be two halves of it. Nintendo is, as always, trying to screw with us. From all of the GS references in FRLG and DP, many think there'll be a remake of the second gen. But as long as it's unknown, there's no place for it on an encyclopedia of Pokémon. The same goes for the timeline relation between RBYGSC and RSEDP. Many THEORIZE that the three-year gap came into play once again, but there's very little concrete facts until we get an official English translation. The only thing we know for sure is that Nintendo's doing a third version. They've done it the past three generations, first time they didn't was FRLG, because some might expect an OceanBlue, and others might expect ThunderYellow. Or at least, that's my theory. I see where yours comes from, and I do think that it could possibly be Opal. But then, we'd risk an edit war over the most trivial unannounced information: What the name of the third version of DP will be. And then... everyone will just throw in random things they thought of on a whim. Bravo my good sir. I was never saying that it SHOULD be added right away, merely speculation on the matter. Besides, you've done quite well in explaining yourself, and I can't help but admire you for all you have to say. —The preceding unsigned comment was added by Clark Griswald (talk • contribs). Hey, I try. I'd probably do the same thing if this was back in Gen III before Emerald, even though I always figured that it was a for sure thing that it would be. Can't say that I didn't doubt that Nintendo would somehow come up with a way-out-there idea for the third version, though, that wouldn't have Rayquaza on it, like a Topaz, to go with Yellow like RS do with RB. That turned into FRLG, though, which was a pretty big upset either way. fact is, there's nothing stopping Nintendo from making Amethyst Version with Crecelia on it, Amethyst was once up there with diamonds, rubies, sapphires, and emeralds as the most precious of the gems. Heck, that'd be a reference back to the GSC mascots much like RSE was back to RGB. We'd have x49, x50, and one of the run-around-the-region guys, whereas last time, we had three totally related ones, just like in RGB. Who says they won't release one about an event Pokémon? Before Crystal, you'd've thought they'd never release one with one of a legendary trio on the box without the other two on the other two versions, right? And Crecelia's not as much event as it is like Latios and Latias. Heck, Yellow was an odd choice for a third version of Red/Blue. Pikachu barely relates to Charizard and Blastoise. The only third version we've seen so far whose mascot relates to the first two completely was Emerald. And... that's not counting Red/Green and Blue, since that got a fourth version, which became everyone else's third. Or something like that. Note also that Ho-oh is related to the more gold-coloured Brass Tower, and Lugia to the Tin Tower. Just because Ho-oh is called to the Tin Tower by the Rainbow Wing doesn't make it Ho-oh's domain. Originally Lugia sat atop Tin, and Ho-oh atop Brass. There were two real towers on either side of a lake in Kyoto as well - and the Gold-leaved tower burnt down, like the Brass Tower. It also had a statue of the Houou bird atop it. The reason the anime get confused about two Tin Towers is because Ho-oh originally atop Brass Tower, and then moved to the Tin Tower ONLY when it was summoned there by the Rainbow Wing held by the GSC player. The Legendary Beasts were ultimately tied to the fate of the Twin Towers and the Silver and Gold Birds who sat upon those respective towers. Suicune happens to be the beast that is the most connected with purification, like Celebi, who was also the focus of Crystal (at least in the Japanese version), so it gets the place on the box. In responce to the above query about Cresselia being an event pokemon, it's Cresselia's conection with Darkrai that get's rid of it's chances to be the third version mascot. Although never explicidly stated, Cresselia's conection with Darkrai has been greatly implied and it is further delved into in Pokemon Mystery Dungeon 2. Cresselia on it's own has not enough personality to carry it's own game without darkrai and as stated above, having an event pokemon in the third game would be like a kick in the face to all those who got it the hard way. Noname If you use the process of elimination, the only pokemon who has a serious chance of rivaling Giratina for the tital of the third game is Mesprit. That's the reason it was protected in the first place, to prevent people from speculating all over it. Diamond and Pearl are aspiring stand-up comedians, while Missy Berlitz is a girl of distinguished heritage who is heading for Mt. Coronet. While these two should have had nothing to do with each other, an unfortunate misunderstanding leads to them heading on a journey together – each assuming the other to be someone they are not – and it just gets worse along the way! 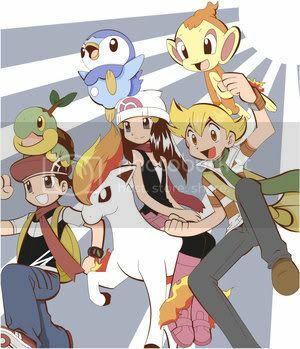 Despite all that, the trio forms a bond of friendship and reliance, as they traverse the region of Sinnoh and explore never-before-seen places! is the frosslass that candice used against platinum in Vs. Frosslass the same one that Platinum uses to search for looker and buck? This page was last edited on 19 July 2016, at 05:03.